April L. Paul, DVM, DACVECC, is an emergency and critical care specialist at Tufts VETS in Walpole, Massachusetts. She is also an instructor at the spay/neuter clinic at Tufts University, where she is director for the Introduction to Small Animal Anesthesia and Surgery Techniques course, director of the advanced surgery elective, and director of high-volume clinics. Her professional interests include trauma, emergency surgery, immune-mediated diseases, and geriatrics. Dr. Paul earned her DVM from University of Wisconsin–Madison. 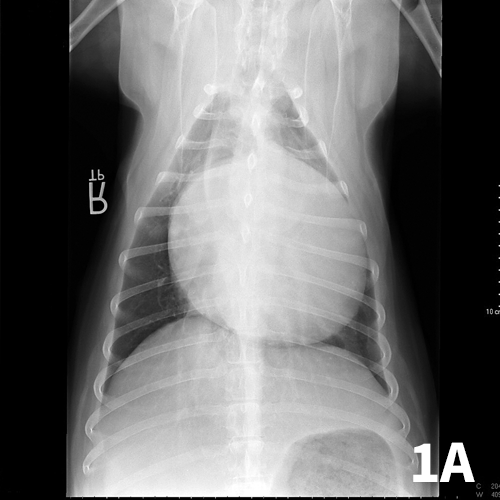 Pericardiocentesis is performed in animals diagnosed with clinically significant pericardial effusion. Considered an emergency procedure in animals, it is associated with cardiac tamponade in which cardiac output is limited. Most dogs with pericardial effusion are large-breed dogs. The most common cause of pericardial effusion is neoplasia, although other causes, (eg, infection, vitamin K antagonist rodenticide intoxication, restrictive pericarditis) are possible. In rare cases, pericardial effusion is idiopathic. Figure 1 Ventrodorsal (A) and right lateral (B) thoracic radiographs showing a globoid heart. Clinical signs include collapse, muffled heart sounds, pulsus paradoxus (ie, an exaggerated decrease in systolic blood pressure during inspiration) or weak pulse, tachycardia, and tachypnea. Jugular venous distension may be appreciated. Abdominal effusion from right heart failure or, less commonly, from concurrent hemoabdomen may also be present. 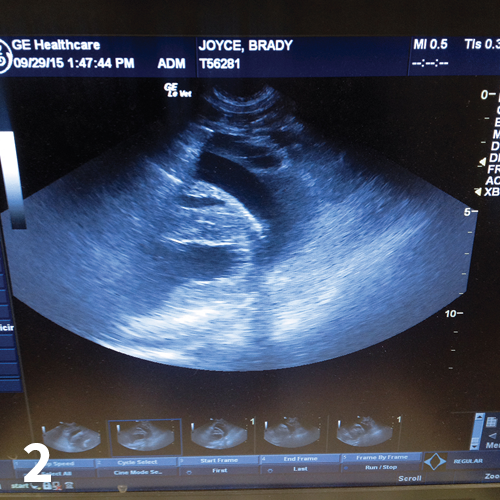 Diagnosis may be based on clinical signs, thoracic radiographs documenting a globoid cardiac silhouette (Figure 1), or ultrasonography (Figure 2). If possible, a complete cardiac ultrasound examination should be performed before pericardiocentesis, as the effusion will help delineate a mass. 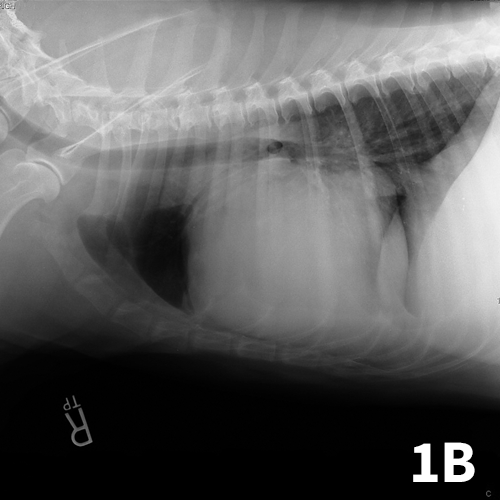 Before performing pericardiocentesis, it is important to discuss with owners the possible complications, which include ongoing bleeding, severe ectopy, cardiac arrest, and death. Without pericardiocentesis, however, death is usually imminent. The patient should be placed in left lateral or sternal recumbency. Pericardiocentesis is typically performed from the right side to decrease the risk for lacerating a major coronary artery. Some patients require light sedation; for others, local anesthesia is adequate. If the practitioner has not performed many pericardiocentesis procedures, or if the patient is active or anxious, sedation is recommended. The planned site must be selected before the procedure. Ultrasonography is ideal to determine a location with adequate visualization of the heart and effusion; if ultrasonography is unavailable, the best location can be determined by feeling for the strongest palpable heartbeat, as there will be less interference from the lungs. Alternatively, the fifth intercostal space at the costochondral junction, found by pulling the patient’s right forelimb caudal to 90° flexion and locating the point of the elbow, can generally be used. The lateral aspect of the right thorax should be clipped over the area where the heart can be palpated. 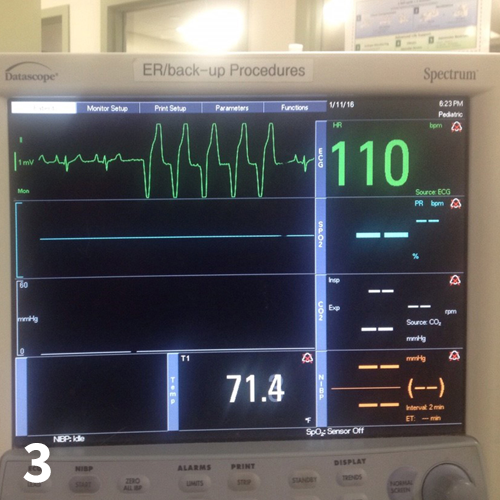 The patient should be connected to an electrocardiograph to monitor heart rate and rhythm during the procedure. The electrocardiogram (ECG) is extremely helpful not only for performing the procedure but also for determining the success of fluid removal by tracking the heart rate. If the catheter is “tickling” the heart, ventricular premature contractions (VPCs) are likely (Figure 3). If this occurs, the catheter should be pulled out a little to resolve the VPCs. If either paroxysms of ventricular tachycardia or R-on-T phenomenon is present, an assistant can administer a predrawn syringe of 2 mg/kg lidocaine IV. If this does not resolve the VPCs, the catheter may need to be withdrawn and the procedure stopped. A prefilled, labeled syringe of lidocaine should be available in case of a ventricular dysrhythmia that requires urgent treatment. If the patient is tachycardic, the heart rate should decrease dramatically as the effusion is drained from the pericardium; by the end of the procedure, the heart rate should be much improved. Persistent tachycardia may indicate ongoing bleeding either within the pericardium or elsewhere. If ultrasonography equipment is not available to evaluate how much fluid remains, the heart rate can be used to find the same information; the heart rate will decrease when the fluid in the pericardium decreases, as the heart can fill appropriately with decreased pericardial pressure. After the procedure, the patient can be connected to a continuous ECG for ongoing heart rate and rhythm monitoring. If telemetry is not available, hourly evaluation and auscultation of the heart for muffled sounds or tachycardia should be performed. Monitoring should continue for 12 to 24 hours, although timing is variable depending on the individual case. Once the appropriate spot for pericardiocentesis has been determined, clip and aseptically prepare the location (predetermined via ultrasound, feeling for the heartbeat, or, in general, finding the area between the 4th and 6th rib [where the elbow hits the body wall when flexed]). To infuse the local anesthetic, insert the needle perpendicular to the thoracic wall just above the costochondral junction through the intercostal muscles. 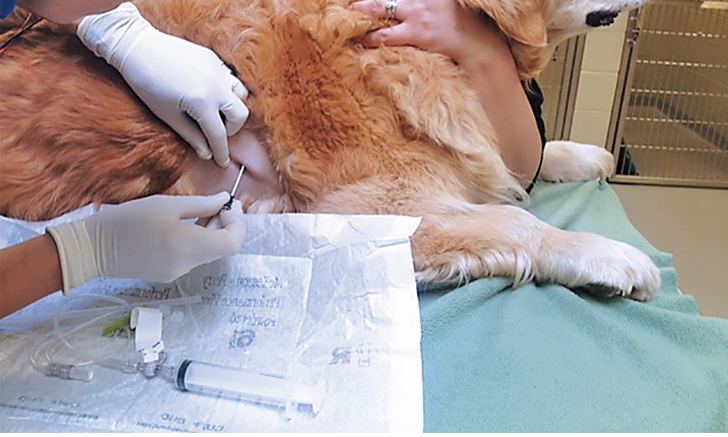 Aspirate to ensure the needle is not in a blood vessel, then instill the anesthetic as the needle and syringe are withdrawn. 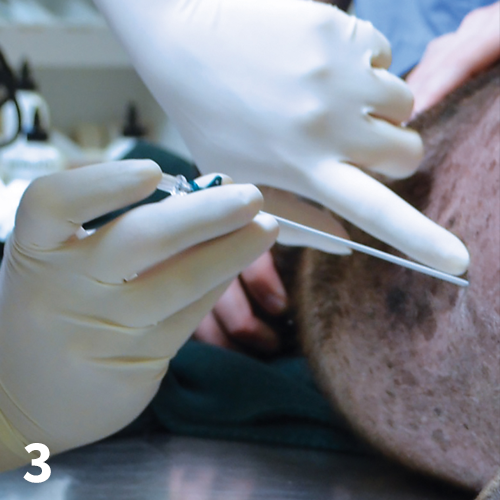 If necessary, mark the site by leaving a bleb or bubble of lidocaine just under the skin. Following this local block, perform a second aseptic scrub of the area before beginning the procedure. Wearing sterile gloves, connect the syringe to the stopcock and connect the extension tubing on the other side of the stopcock. Pass the syringe to an assistant, as the syringe end of the setup does not need to be sterile. Grip the hub and hold the stylet and catheter together. This positioning is important because it is easy to accidentally push the catheter slightly off the stylet, which may prevent access to the pericardial sac. Use your nondominant hand to tighten the skin as you enter to help prevent burring of the catheter. 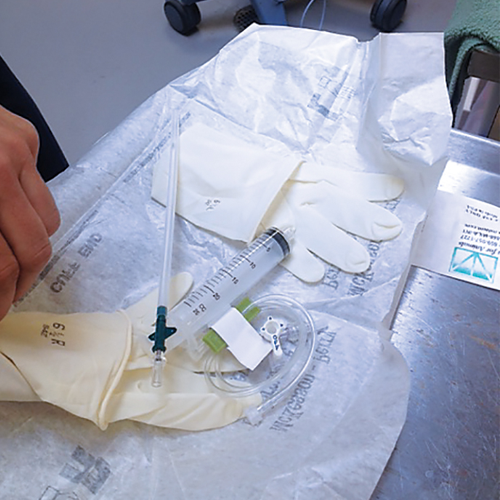 Using the lidocaine bubble as a guide, gently push the catheter straight in and slowly advance it until you see fluid in the hub of the catheter. 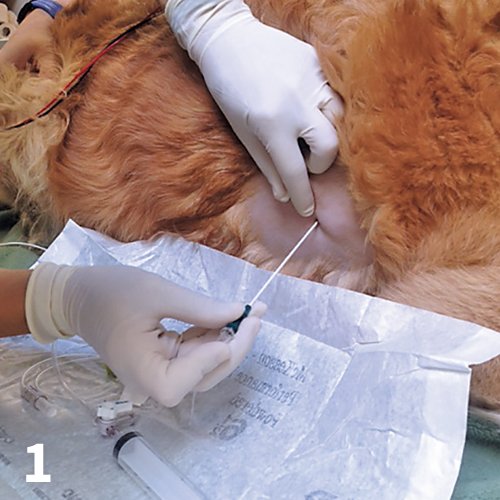 Once fluid is observed, advance the catheter off the stylet for 1 to 2 cm into the pericardial sac. Remove the stylet, then aseptically attach the extension tubing to the catheter hub. Have an assistant withdraw fluid by gentle aspiration. Most pericardial fluid is very bloody and appears grossly like venous blood. Hold the catheter in place while an assistant withdraws fluid. 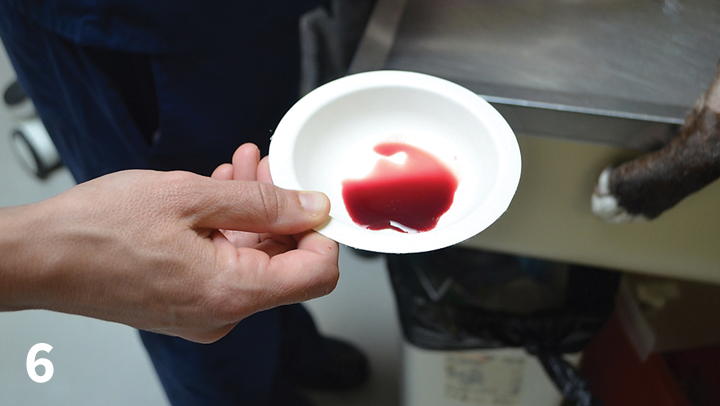 Empty a small amount of fluid into collection tubes, and put ≈5 mL into a small dish to evaluate for clots. Clotting blood may indicate a lacerated coronary vessel or active ongoing hemorrhage from a mass. 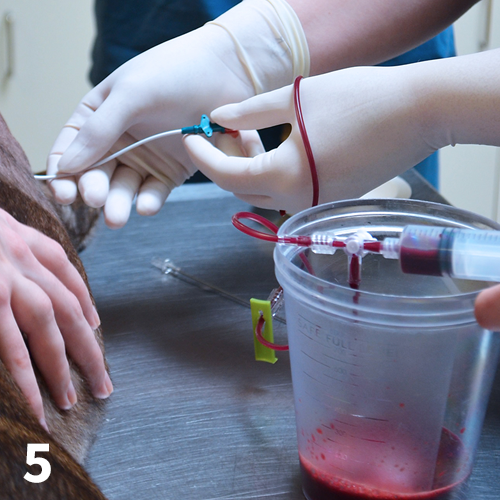 Remove the catheter immediately if clotting blood is observed. Remove as much effusion as possible, emptying the syringe into the collection vessel. 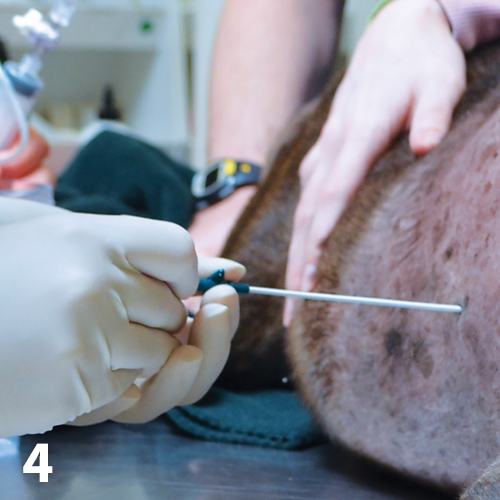 If negative pressure occurs, back the catheter out little by little and aspirate each time the catheter is moved. 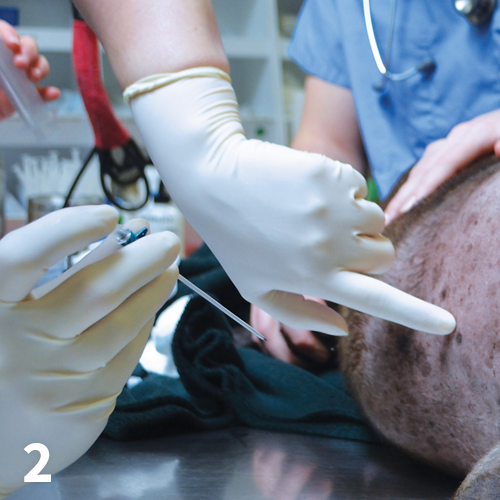 In large-breed dogs, the volume of pericardial effusion can reach 300 to 400 mL; however, in some cases, the volume is much less, as the effusion drains into the thorax. 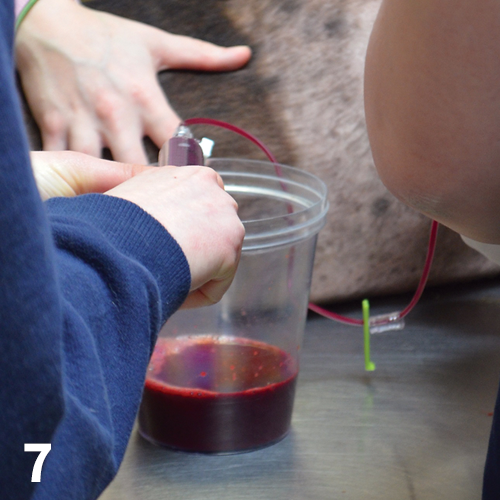 If the blood has not clotted, remove as much effusion as possible and empty the syringe into the collection vessel. Submit collection tubes for fluid analysis, along with tubes that can be used for culture for the rare case of septic pericarditis. Instead of turning the 3-way stopcock open to a collection bucket, the author opens it over collection tubes to secure the sample. Whether to culture can be decided after cytology results are received. Pericardial cytology is generally not rewarding but may be diagnostic in some cases (eg, lymphoma). 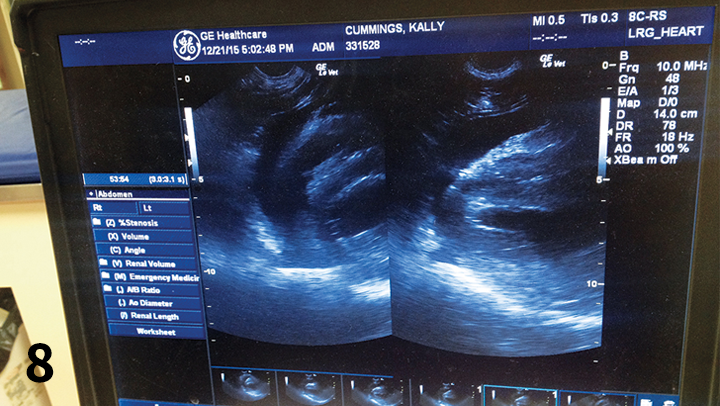 Repeat ultrasonography can help determine how much fluid remains in the pericardial sac. If a large volume of fluid remains, recheck in ≈10 minutes. In some instances, the fluid will have drained through the hole created in the pericardium during the procedure. If a recheck ultrasound demonstrates a continued or larger volume of fluid, repeat pericardiocentesis, particularly if the heart rate is still high or tamponade is present. Do not judge the success of the tap based on the volume of fluid retrieved. In many cases, only a small amount is collected but the result is dramatic improvement of cardiac output, as fluid leaks out of the pericardial sac into the pleural space.